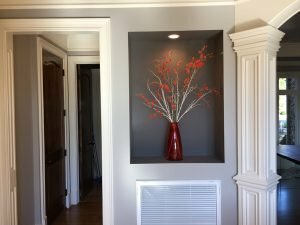 Customers often ask me for paint color suggestions: Colors that I like, or those that I have used on previous painting projects. Some of them just to seemed to work well together after the painting was finished . What a paint looks like on a sample color swatch and after it dry’s in rooms can be very different from what you expected. In this post you will see paints/colors that we have actually used on our paining projects. I hope you find this blog post helpful in your color choices for your next painting project. If you are looking for a color consultant to help you pick paint colors, then please call Nashville House Painters at 615-417-3873 or complete our online request form.